As readers of this blog may know, the last thing I enjoy with a glass of wine is a list of rules. I’d much rather join the circus. Communist Party. It was a very crisp, cold weekend. 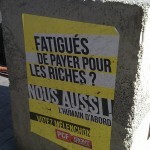 Pamphleteers handed out how to vote slips for Francoise Hollande. 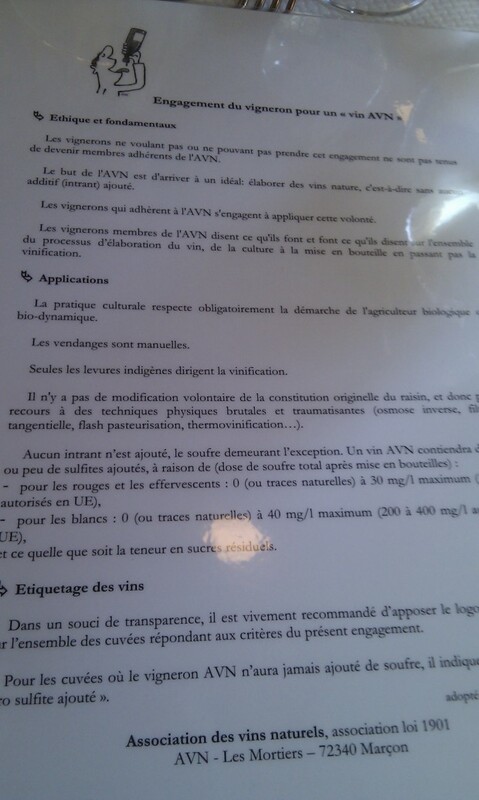 My experience of natural wine has not been easy. On the one hand, I hate the word “Natural”. To keep with the election theme, it is redolent of the fascist. A lot of things are described by right-wine politicians as natural and it is used as a club on anyone that is different. Before I even reach for the glass, the word “Natural” rankles me. Yet… I have worked in Fine Wine for the past 5 years (and in wine for over 10 years), and I have seen not only the price of wine go up exponentially, but also, my ability to buy it, find it or simply drink it. A taste inflation, if you will, which has not kept in line with the cost of living. As I said to Neal Martin recently over a glass of retsina at a Greek restaurant (he had a glass of water), I may never be able to have a cellar of Lafite and Salon, but I will be able to have a cellar of interesting wines. 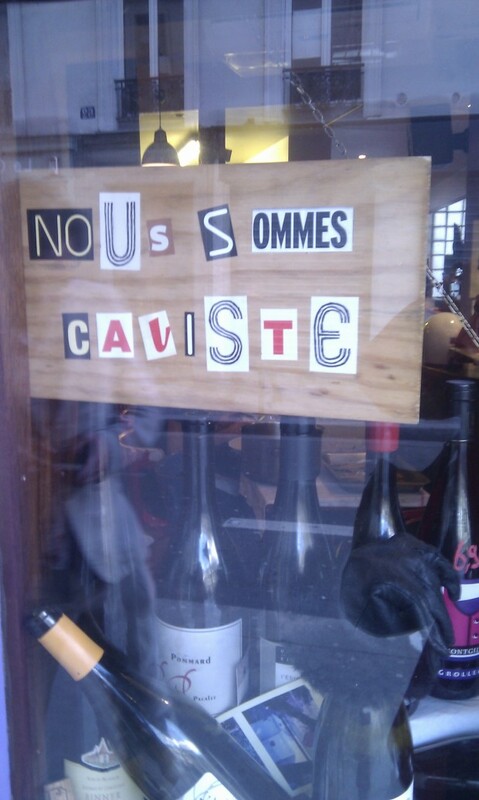 And many wines from the Loire and Jura fall into this category. natural wine. If you know how wine is made then there is something very creative about it. Like all creative endeavours, there are some howling messes along the way, but even they are quite fascinating. 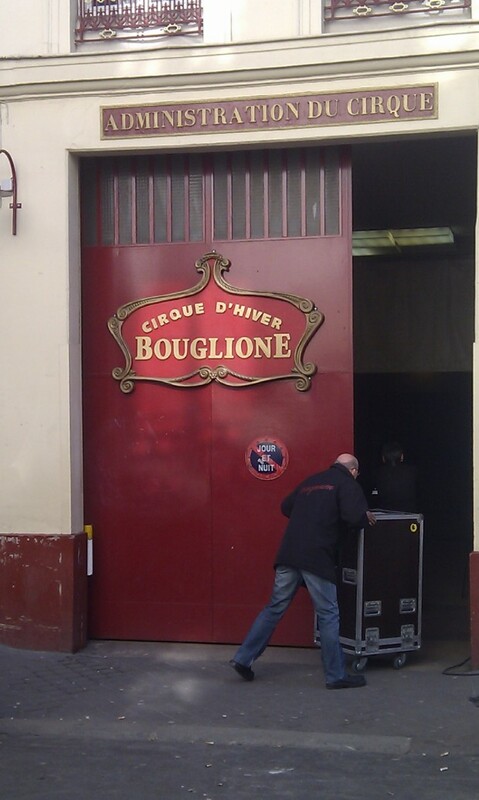 is what it says: the entrance for artists, next door to the Administration du Cirque (8 rue de Crussol, 75011). This is a very cool little bar with an excellent list of Loire producers such as Etienne Courtois from Cour-Cheverny in the Loire. There is Au Nouveau Nez (the new nose) in the 20th arrondissement with a roll-up garage front, and a slightly larger branch in Oberkampf (114 rue Saint-Maur, 75011) with a wall which is an excellent guide to natural wine. Throw a dart and you will find something interesting. The 10th and 11th arrondissement is a good walk from the 20th where I stayed (near the Pere Lachaise cemetery). 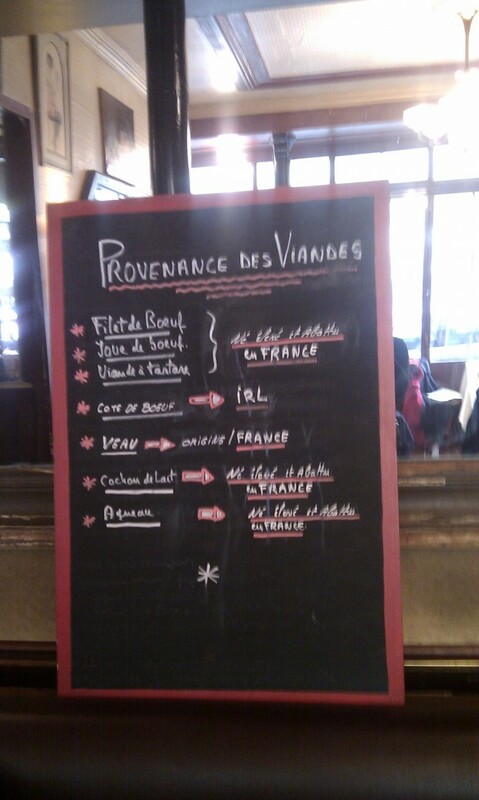 Next to the Canal St-Martin, you will find Le Verre Volé (The Stolen Glass) where the waiters were quite happy to talk about Jura at the end of lunch service, ripping off a sheet from their receipt pad with a scribbled list of names to look out for. I had a fantastic Franche–Comté for lunch. 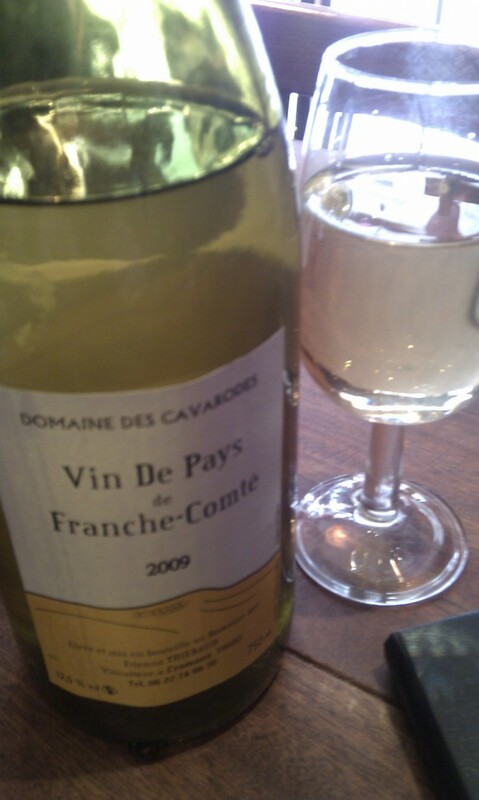 It’s a nice touch to ask for a glass of wine and to have the bottle left on your table. As well as an exercise in self-control. Another time at the Le Verre Volé, this time with @donalde, we had a 2010 Chablis (“we must have a Chablis as english tourists”). Looking for a name of the producer, I found “Les Vendangeurs Masqué” – which roughly translates as the hidden grape-picker. (I later found out it is a wine made by Alice and Oliver de Moor). What I would expect from this perfect vintage for Chablis, it was like licking a rock from a fresh-water stream. It went very well with the snails in garlic and orange. I expected to be hit with a lot of politics (either natural wine or the upcoming elections) but for the most part Parisians gave the usual shrug and bof. I found a stronger view: to be close to the source of the wine. To be close to the producer. Whether the winemaker came into the restaurant or how everything was detailed. A strong sense of acknowledging the place. On Rue de Paul Bert, past the ‘Tesco Metro’-sized supermarket (a topic which perhaps inflames more than the mention of Carla Bruni – the topic of pouvoir d’achat, or, purchasing power of supermarkets), there is an excellently ramshackle, but always full, wine shop called Cru et Decouvertes. The owner was more than happy to dig through his boxes to find me a Touraine red he had found at the recent La Dive Bouteille wine festival, called, “Ca, C’est bon!”. Across the road is the wonderful Bistro Paul Bert (18 Rue Paul Bert, 75011), where we are greeted by a laminated manifesto at the front door while we wait for our table. Uh-oh, I thought, rules! Before walking back out, I saw their excellent menu featuring two producers I can’t seem to enough: 2007 Overnoy Arbois Pupillin and the pale red, 2010 Jean-Francois Ganevat, Cuvee de l’enfant terrible Poulsard. I left Bistro Paul Bert exclaiming to the shimmering winter sun in the perfect Paris blue sky: what an excellent meal!!! Passing a small bar of Argentinian wines, we walked to Retro’ Bottega (12 rue Saint-Bernard, 75011). A great play on the italian word, retrobottega, the back room in a shop. 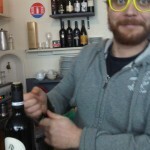 And that is exactly how big it is: an italian épicerie-à-manger specialising in Italian natural wines and charcuterie. We had a sangiovese that seemed to sing, pillowy soft rather than strangled by over-extraction. It was time for me to jump on the Eurostar home. With only half of my list of natural wine places seen but with my mind changed. I can see why there is a strong impulse by Parisians to emphasise the producer, especially with the rise of the supermarket in France (which has not yet destroyed Italy but has completely devastated the UK traditional foods such as the native plum). As a wine producer country, perhaps it is easier for this link to be maintained between the wine producer and the wine consumer. When I asked twitter the question, “why are there more natural wine bars in Paris?” it certainly is not a cheap place to rent, the answer came back – because it is romantic. This is not the answer even if the names of the places are poetic enough. What seems to be driving the movement here, at first glance, is the link between the winemaker and the wine in the glass, rather than simply the lack of sulfur, and there is a DIY movement in some parts of Paris who want to create something real in a tough economic environment. A deep impulse for the artisanal product, slowly destroyed by the industrial economy. This is the creative result. Even after joining the circus there are still rules and paperwork to be done at the Administration du Cirque… The main thing is to enjoy the show. Great article, Juel. In a way it makes sense that Paris with all its little neighbourhoods and side streets has room for wines off the main road. Many thanks Uwe. Some are so small, it is can be a case of blink and you’ll miss it. Thanks for letting me know about this shop – it is now definitely on my list for the next trip (hopefully soon-ish!). Hi Juel, great piece – but you don’t seem to mention much about the matter of… literal taste. Hi DB, not quite sure in which sense you are talking about taste… If you mean the literal taste of the wine, the ones I had, tasted wonderful – to the point where I wondered if the wines we are tasting here in UK are not transporting well… none of the funk that I’ve tasted here (which I don’t agree is not a fault). Very soft, clean, perhaps the Chablis was a little drier than other 2010 Chablis I have had the opportunity to taste since last November and 2010 Burgundy En Primeurs.The food was very good.